The 2013 Chevrolet Malibu is all-new yet retains many of the elements that made the model so successful the last time Chevy did a complete changeover. It offers a roomy, comfortable interior and, in the Eco version, an innovative fuel-saving technology that uses a lithium-ion battery to supplement the gasoline engine. A simple, reliable car for anywhere you go. I really love my Chevy Malibu. I have had very few problems with it since it was purchased. It was bought used, but the car was still in very good condition. I have had some problems with the change oil light coming on for no apparent reason (since I had gotten my oil changed maybe 1000 miles previously). The ride is quite smooth and the amount of road noise on the highways I drive every day is pretty minimal. My husband and I took this car on a pretty long road trip a year ago and it worked beautifully. It fit all of our luggage, camping equipment, food and other supplies with room to spare. We drove through mountainous areas and for long stretches of time with no problem. We even got pretty good gas mileage when all was said and done. The sound system is not anything special, but that wasn't important to me at all. I think this will be a great family car when my husband and I decide to start a family. The seats are comfortable enough for my taste (remember the long road trip?) And I love that I can connect my phone so that I can answer a call without ever picking it up. Overall, I have enjoyed driving this car and do not see any reason not to recommend it to other buyers as of yet. My Chevrolet Malibu: this car has been a great experience and price for me! I use my Malibu mostly to go to work and back every day. We go shopping at least every two weeks and sometime every week. I have less than 28, 000 miles on it. I have gone on trips with it and I have not had any problems at all. I had to replace the brakes and rotors on it a year ago and I replaced the tires right before winter, the original tires Michelin" lasted the whole time and they still was good with around 6/32 of tread wear still on them before they was to fail the state inspection. 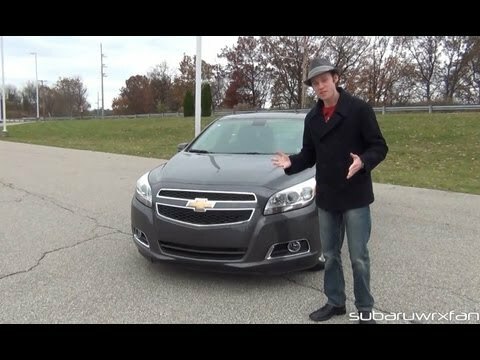 I have only good things to say about Chevrolet Malibu" I have had vehicles that would have needed engine work done like spark plugs or computer issues. I have changed the oil every 4, 000 miles or less at that time I also rotated the tires and them re-balanced. I have been real lucky or just good at taking care of it. The car looks new still - interior is awesome - during the year I clean out the inside every week when it is warm enough. This car gets a 5 star rating from me and the wife - she really enjoys driving this car. Sleek and dependable, the Chevy Malibu is a car for anyone! I love my 2013 Chevrolet Malibu. I purchased it when I was still in college because I needed a dependable car to get me to and from classes/work as well as home to visit family. I have never had any issues with my Malibu. I take it for routine oil changes and tire rotations but that is the only maintenance I have to do. I also love the great gas mileage. I can fill up my 16 gallon tank for less than $35. 00 which is awesome and then I get about 30 miles to the gallon. I also feel very safe in my car. I do not feel crowded or claustrophobic like in some tiny cars. It is the perfect size even for passengers and luggage. The trunk is surprising large which I love and when I lay my back seats down I can fit even more! I think it could be a great family car, too because of the amount of space on the back seats. I highly recommend my Chevy Malibu. When I get ready to buy a new car, I'll probably just buy another Malibu!